Can you believe this month is over? I can’t. This year I see that I have written more poems as a post or within a post. I have taken you into schools and shown work by special education students that inspired me. Then that post inspired Bonnie to write. Plus I happen to know that post was passed on to another special education teacher and a kindergarten teacher and they are planning their own writing. I am anxious to see the results. The weather played a big part in many posts. Mostly whining about winter hanging around too long. I was a copycat. I read other posts and they became my mentor. Emails were sources of posts. Life gives me something to write about. The sheer volume of posts available was overwhelming. I’m sorry I could not read every one. This challenge brings out the most interesting people who tell the most interesting stories of their lives. My heart breaks for the sadness and troubles you have written about. My heart fills with joy for the birth of new babies to the slicers. I have laughed over the funny stories written. I have lingered over stories that touched me. I have made connections to stories you tell and related them to my life. You have made me a better person by the examples you have shared. You have pushed me to be a better writer. So another challenge has been met. I have loved every day of it. This day will not be the end of my writing. 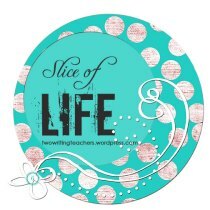 Tuesday will be here and another slice will be linked. So this is the beginning of a new year of sharing a slice of my life, Elsie Tries Writing, and she likes it! Thank you Stacey and Ruth, you are the rock stars of my writing world! Here I go again, borrowing from another slicer. Alan (Living Life Twice) played with Book Spine Poems but then he decided to carve out another form of poetry. 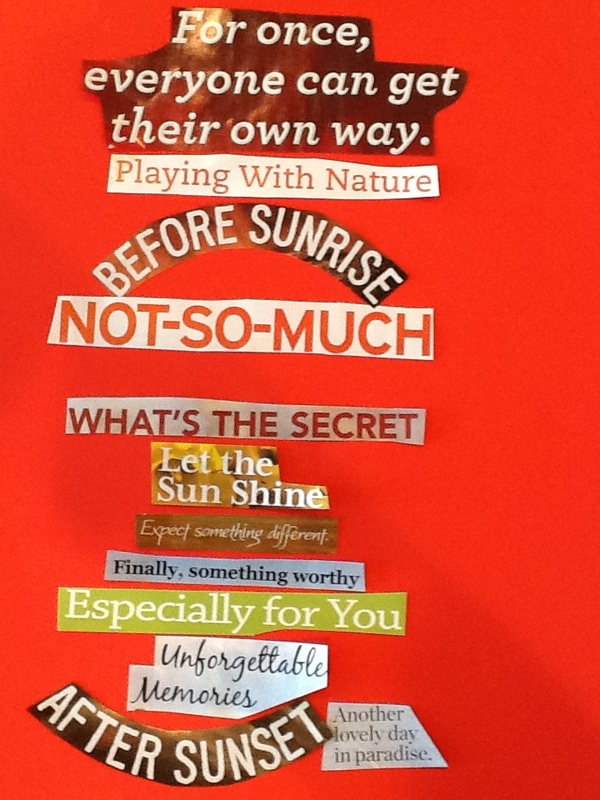 He began cutting words and phrases from magazines and newspapers to create two wonderful collage poems. That looked like fun. I think I could do that too. How hard could it be? Snip a word here. Snip a phrase there. Ta-dah! A poem is born! Hold everything, I’m here to tell you it is not that easy. It has taken me a week, scouring the magazines that have been collecting dust on the desk, to find enough words/phrases to create a semblance of a poem. Alan made it seem easy breezy, but I found the editors of my magazines were not very helpful. Their headline/caption copy left me wanting. Finally (insert sigh here) I snipped myself a collection of possibilities. 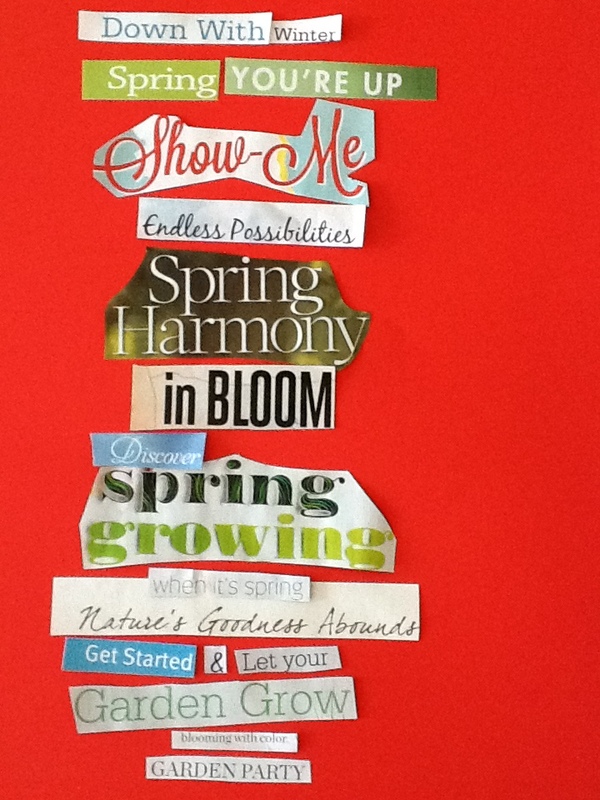 Oh the possibilities abound with these words and phrases! 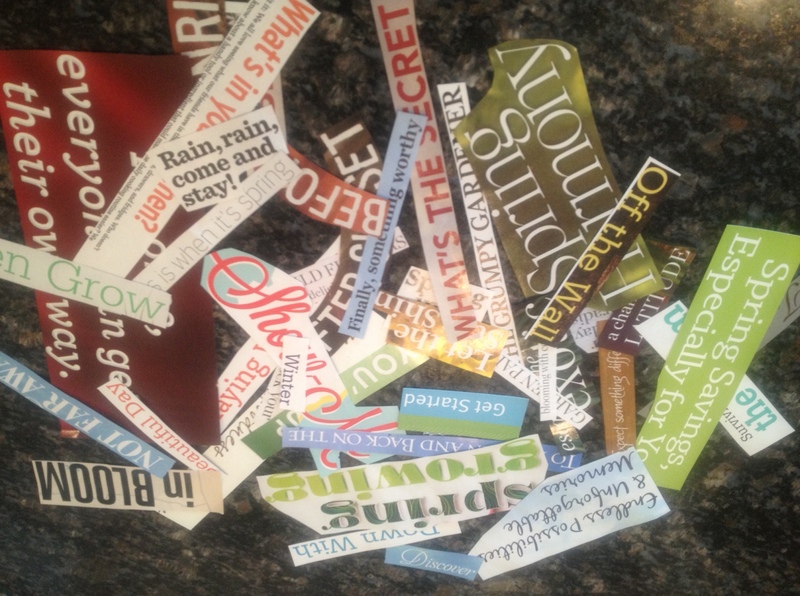 As I spread them out on the counter, I started looking for ideas that would go together. Start with this one. No not that one. Move this one before that one. Read it aloud. That doesn’t sound right. How about move this line up here. Cut that word out of the phrase. Over and over the process continued until I had something I could live with. The end result is below. This was fun, but not as easy as I thought it would be. I think kids would have a blast with this, but they really need some time to collect the words/phrases. One class period would not be enough. Be sure you try it before turning it over to the kids. As you have discovered this month, posts beget posts. Linda, from Teacher Dance stirred something in my mind as I read her post about trees this week. As she described the special trees in her life, I tried to make a connection to any trees that I have known and/or loved. The first one that came to mind was a weeping willow. Actually there were two of them in our backyard. When we moved into this house I was just starting high school. I thought those trees were magnificent. I loved the way the branches cascaded down like a fountain. But all those thoughts changed as I got to know these trees. They were forever shedding small limbs that acted like whips in the hands of my brothers. It was a perpetual job to go out and collect these limbs. As you fought your way through the draping limbs (that I once thought were so lovely) to the inside of the canopy, there were small biting gnat-like bugs that would cover you. I shudder as I remember the bugs crawling along the back of my neck. If that wasn’t bad enough, the weeping willows blocked any breeze that tried to reach our house. No fresh air passed through those branches to cool the inside of the house (days of no air conditioning) when they draped onto the ground. To remedy this situation, my mother would attack the tree with a huge pair of clippers and give the tree a haircut. I wish I had a picture of the tree trimmed. It was a blunt cut, straight across as high as she could reach. However, it served its purpose, air could get to the house and you were not covered in bugs from running into the branches when mowing the yard. Yes, I like the look of a weeping willow. No, I will never put one in my yard. The other tree that came to mind was a baobab tree. Now that’s an odd tree, you might be thinking. Yes, it is, but it has been in my mind since my high school days of French class. We read Le Petite Prince several times during those years. The prince was always plucking that tree out so it would not overtake his planet. That tree intrigued me. I had never heard of it, so I researched it. That my dear readers was not a simple task in those olden days before our friend Google. 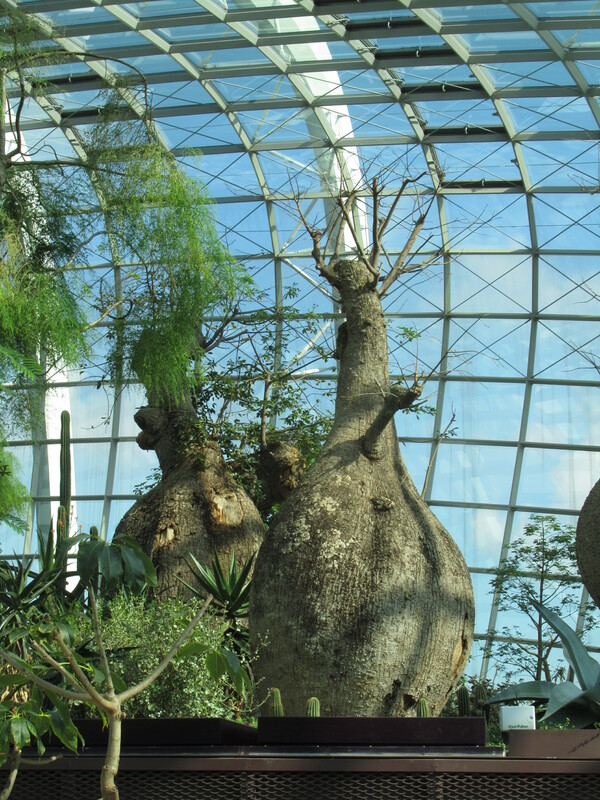 So can you imagine my sheer delight when I was in the Flower Dome of the Gardens by the Bay in Singapore this December and I discovered the cool tree I was admiring was a baobab tree. That is one special moment, as it brought the little prince back to me, but no one around me had the slightest inkling of what was going through my mind. Check, there went a bucket list item that I didn’t even know was on the bucket list. Isn’t this the coolest looking tree? It’s 10:45, oh no! I meant to put the roast in the crock pot at 9. Hmmm, what to do? Change dinner plans and do something else or turn the crock pot on high, hope and pray there is enough time to cook the meat. I opt for high crock pot heat. I spring into action. Fortunately this recipe has minimal ingredients and there is absolutely no prepping needed. One critical element is the crock pot liner. If you don’t use them, you are missing the boat. They make clean up a breeze. Within five minutes the crock pot is on high and all it needs is time to create the magic which will turn into the entree for dinner. By dinnertime this will be full of a barbecue-like sauce. 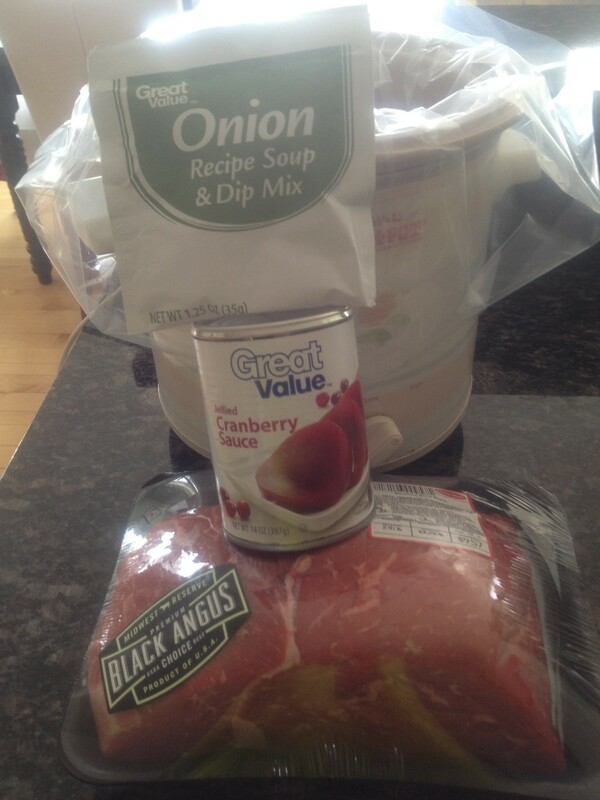 Onion soup is on the bottom, cranberry sauce is scooped out on top of the roast. 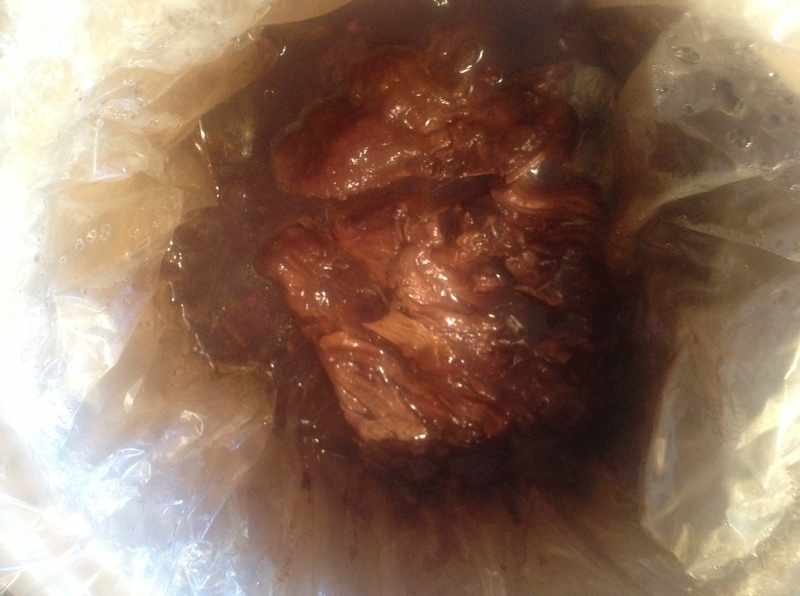 I leave home for several hours, but when I return the scent of the simmering meat greets me. Quietly I breathe a sigh of relief, this smells right. Dinnertime rolls around, the additional sides have been prepared and the moment of truth is about to happen. I lift the lid. 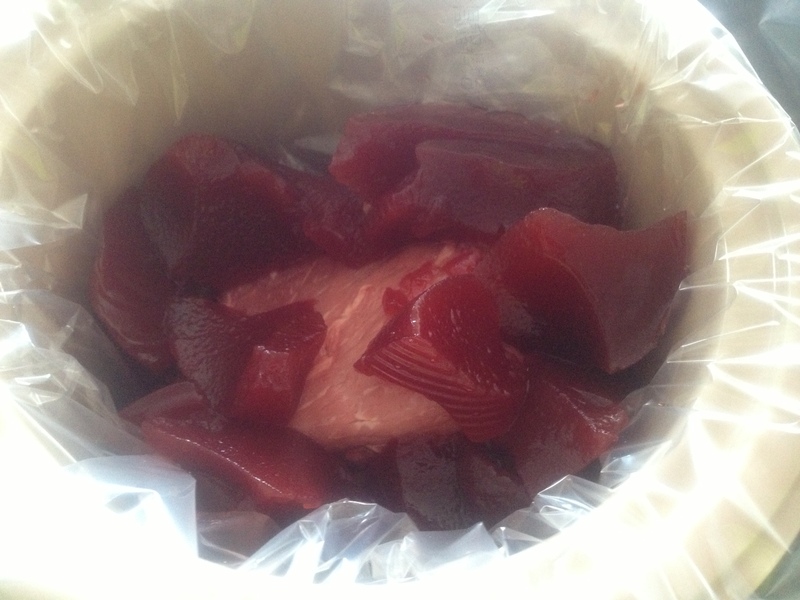 I poke the meat, looking to see if it is fall apart tender. It falls apart. Yes, it is tender! Dinner is saved. Dinner is served! Check out all that juice. Can you spot the differences in the pictures above? The one on the left was waiting, on the island in the kitchen, for my husband when he got up February 14. The one on the right was also on the island when I got up. Hmmm. . . what does this mean? You will notice it is the same bottle of wine in each photo. 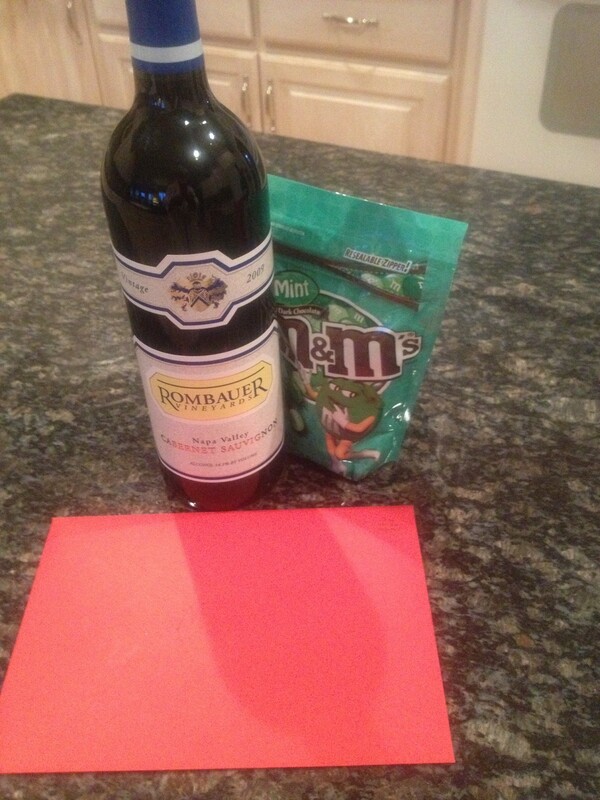 This is the first time we have ever bought each other a bottle of wine. My cousin spoiled our palates with this wine last fall. 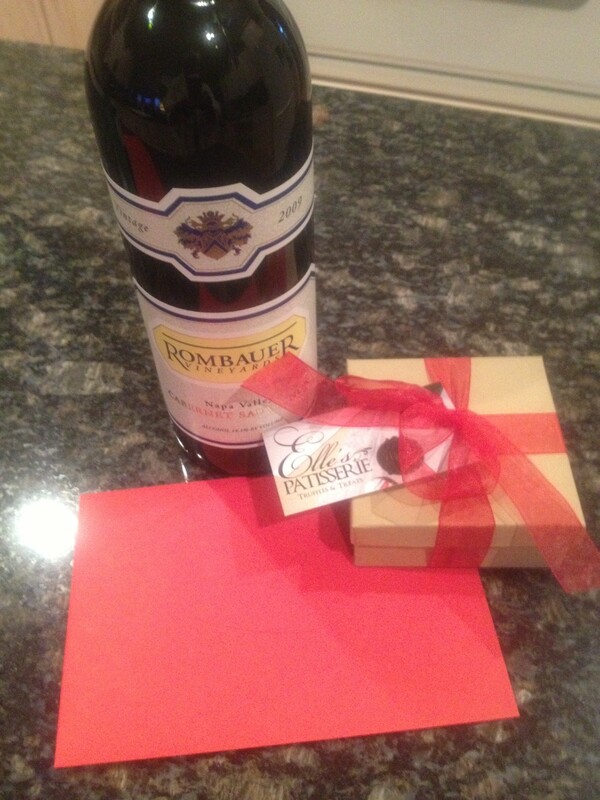 (Rombauer Winery, cabernet sauvignon) It was so smooth and buttery, we loved it! Then we found out how much it cost. Yikes! That is way above what we usually spend on a bottle of wine. (You can tell we are not wine aficionados, but we do enjoy a nice glass once and a while.) However, the idea was filed away in my mind that this might be something special to get some time. Apparently, my husband filed the same thought away. One day as I was shopping, I saw the dark chocolate mint flavored M & Ms and knew that would be something my husband would love. 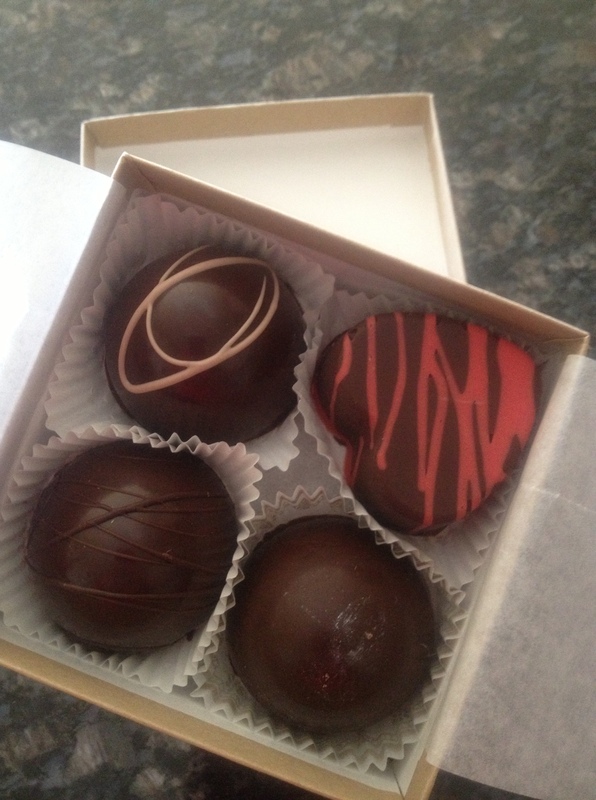 He went to a small patisserie and bought hand-made dark truffles for me. Obviously, he wins on that point. Finally, we each had a card in a red envelope. I burst out laughing when I saw the items on the island. We’ve been married thirty-five years. Are we morphing into the same person? This was too funny but yet a bit scary. Rain changed over to snow, just like the weather man had predicted. The grass disappeared within an hour of the precipitation change. Once again trees and shrubs wore their frosty coats. I am hoping this will be the last time for many months. The day moves in slow motion, in contrast to the whipping wind outside my windows. This is not a day to leave the warmth of the house. So small tasks that had been put off, are completed. Receipts are filed, expense reports and time sheets are completed, and books are returned to shelves. The day continues to crawl along. It is quiet. There are no sounds other than the wind gusting, loudly at first then dying to a whisper. It is a constant battle of strength. I begin The False Prince, but my eyes grow heavy. My head throbs with each word I read. I close my eyes and rest. Although my body seems still, my mind jumps from one topic to the next. The most pressing need is I need a slice for tomorrow. How can I describe this day? Slowly I plan it out as I drift away for a few minutes. I am aware of the wind again, the creaking of my husband’s recliner as he leans back. My slice that sounded so good in my head moments before, evaporated as I turned on the computer to begin composing. My fingers could not remember the words to type. Time for contemplation is gone, supper must be prepared, My time on the couch has ended for this afternoon. A slice has been written, all the while the blustery wind has caused the trees to perform twists and turns they did not know was possible. Check out the picture below, do you notice something missing? Not sure, let me explain a bit further. I am in my car on a road. The window is down to get a clearer image. What’s missing? A fence you say? 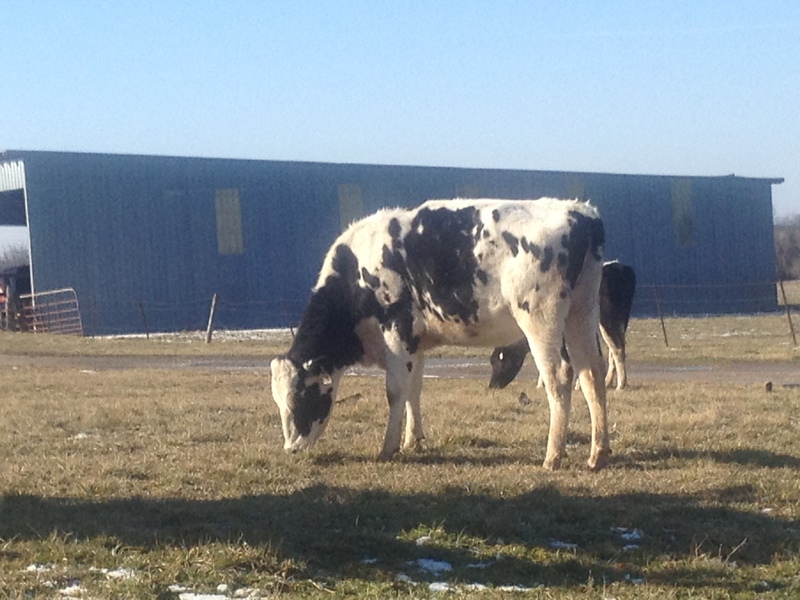 Yes, these two bovines are wandering free. I think they may be looking for that elusive greener grass. I pause to think what I should do. Do I tell someone or just head on to the store? What would you do? I decide I need to tell someone. I back up more to enter a driveway of the house closest to where the cows are. Hmmm . . . there isn’t really a front door. There is a door on the side, but there is a treadmill wedged in that space. I continue on to the back deck/porch area. There is a vehicle parked out back, so I figure someone lives here. I knock on the back door. I wait. I wait. No one comes. I don’t know what else to do, so I leave. The cows are still nibbling. But I will check on the return trip and try again. Forty-five minutes later, I am returning, but this time I approach slowly. Not a cow in sight! I scan the fields and yards around, but still no cow. Hopefully, the cows are safe, but you know the next time I head down that road, I will be looking for cows on the loose.